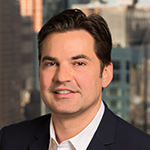 Gabe Bevilacqua is the Senior Vice President of Product Management for Advanced Advertising at Viacom. The Advanced Advertising group leads ad product innovation and advanced analytics across all screens and platforms, leveraging a diverse team of data scientists, researchers, engineers and product managers. He has over a decade of experience in data-driven marketing technology. Prior to joining Viacom in 2015, Bevilacqua was the Chief Operating Officer at the company he co-founded, Rallyverse, a content marketing platform that powers social media and content campaigns for Fortune 500 clients. Previously, he spent six years at Microsoft working on their digital advertising platform, most recently as Director of the Advertiser Tools Business Group for the Atlas Advertiser Suite. He also held positions as Global Brand Manager for Guinness World Records, and held business development roles at Urbanfetch and Cductive. He graduated from Princeton University and holds an MBA from Columbia Business School.